We’re thrilled to be hosting the New Esterhazy Quartet for the first time. This Bay Area string quartet has been together and performing regularly since 2006, specializing in music from the Classical period on period instruments. As Haydn experts—the quartet has performed all 68 of Haydn’s string quartets and created four recordings of them—who better to introduce us to works by composers who influenced him? This is a program they’re calling “Haydn & His Teachers”, with music by Georg Reutter, Nicola Porpora, JJ Fux, CPE Bach, and, of course, Haydn himself. Musicians Kati Kyme and Lisa Weiss, violins, violist Anthony Martin, and cellist William Skeen are all specialists on period instruments. 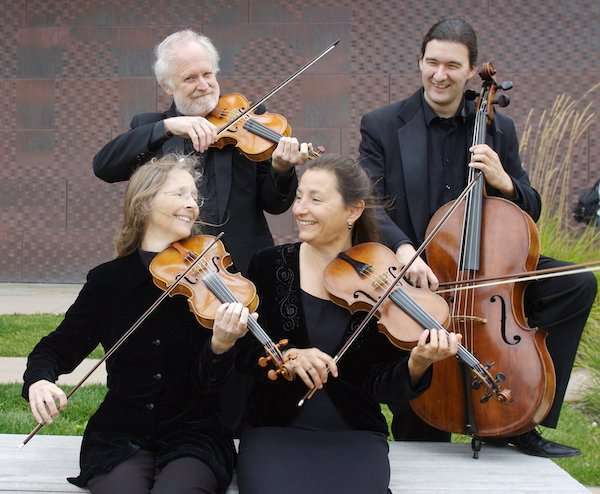 In addition to playing together as a quartet, all four of them play regularly with other Bay Area ensembles, including the Philharmonia Baroque Orchestra and American Bach Soloists. Check out a video of the quartet playing here. And here’s an SF Chronicle interview with violist Anthony Martin. Reservations are required. See the RESERVATIONS page to reserve seats.